Elliot - "It might be fun to get caught eventually." Ellen - "Well, until then, make like an Abra." Pokemon are caught with pokeballs and can be found in tall grass. There. That should be sufficient for the 0.05% of you who are unfamiliar with internationally recognized franchise. What about Abra, you say? It's a pokemon that's really fast and likes to teleport before you can catch it. They are jerks for this very reason. 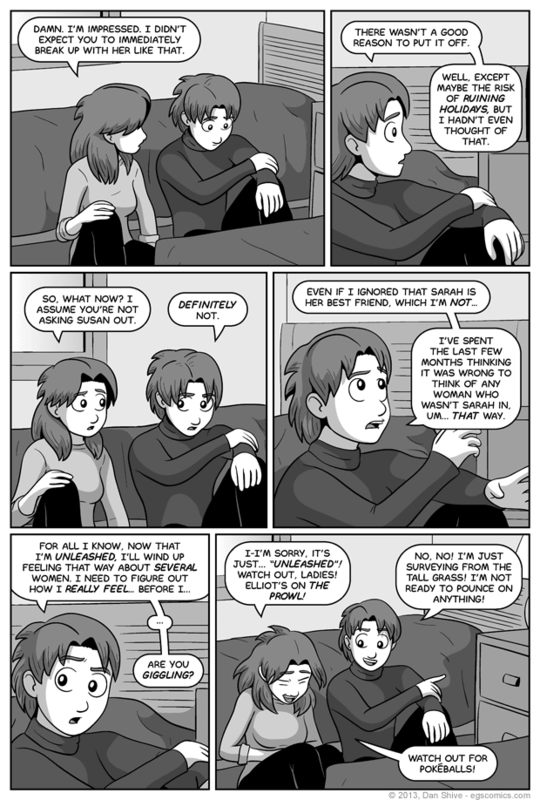 This comic further drives home home the point that there's little chance of Elliot immediately trying to date Susan (or vice versa). I don't know if anyone was hoping for that, but I'm prepared to hide at a moment's notice just in case.